In summer 2013, David was voted by the students of BioMechanical Engineering as their best MSc teacher, for the third time in a row! In October, David heard he also won the award for Best Teacher for the entire Faculty of Mechanical, Maritime and Materials Engineering (3mE)! 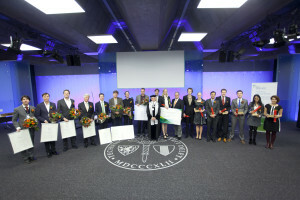 As such, he was nominated to represent 3mE for best teacher of the TU Delft. 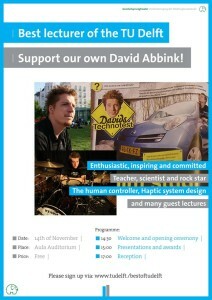 For this event, a special movie was made about David by Hermanos Media Solutions, check it out here. Besides the honor, David received a gift package from Gezelschap Leeghwater, a personal check for 1000 euro, his course will be selected to be published online through OpenCourseWare, and he will receive 3000 euro to improve his courses.